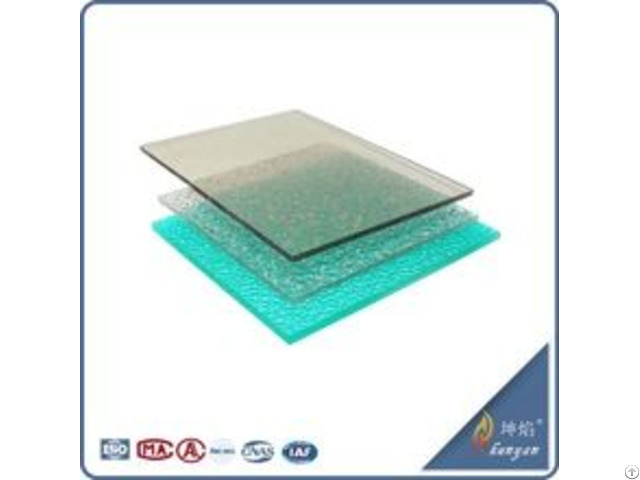 The insulation performance of four-layer hollow PC sheet compared with the same thickness structure two-layer sheet and three-layer hollow sheet with higher strength, better sound insulation and better heat preservation, is the preferred material for greenhouses, stations, stadiums, shopping malls and other large buildings roof: using imported raw materials and advanced international polycarbonate production process. 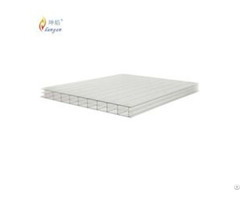 The surface uniform distribution and high purity UV co-extruded layer, can effectively absorb ultraviolet light, prolong the service life of the PC sheet. Product features: 1.Light transmission:12%-82% for different colors. 2.Ultraviolet-proof and aging-resistant:The product surface contains anti UV coextrusion layer, high outdoor weather resistance, can still maintain good optical characteristics and mechanical property after long-term use. 3.Shock resistance:High toughness, difficult to damage in transportation, installation and use.The impact strength is 10-27 times that of organic glass. 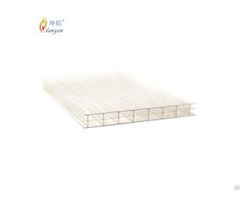 4.Heat preservation:Special hollow structure, can effectively reduce the energy consumption of building temperature regulation. 5.Sound insulation:Hollow structure and polycarbonate's excellent sound insulation property can reduce noise effectively. 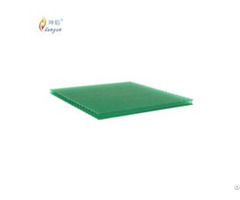 6.Nonflammable:Reach the GB8624-2006 B-s1, d0, t0 certification level. 7.Easy installation:Easy to install, can cold bending.